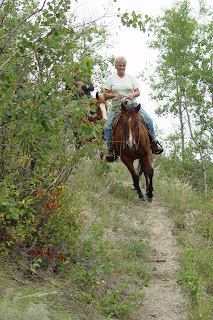 One summer a few years back, a friend and I were riding a trail on my property. The trail wandered down a steep sandy bank, through thick brush and across a muddy, trickling stream. I rode a young mare who had not been out of the arena much and she was, predictably, balking or spooking at obstacles - real and imagined - on the trail. “Always challenging riding a young horse, isn’t it?” I commented to my friend. I was silent for a moment, pondering the wisdom of that statement as we slid down a very steep, sandy incline. Positive thinking. That's what he chose. Joyful anticipation over frustration. He shared his horse’s keen awareness of surroundings instead of getting annoyed or angry. Single file now, we continued along the path with the Chilcotin River roaring beside us - down a twisty, rocky trail above the river and into willow and poplar. My mare, still bug-eyed, moved in jerky steps - start, stop, start - as I urged her into the trees with my legs, directing her head with my hands and periodically taking a hand off the reins to brush branches to the side. When we came to a little boggy stream across the trail, she balked. "Okay, girl," I said. "It's pretty scary. I'll get some help." I asked my friend to take the lead and my little mare followed. If I really pay attention, riding a youngster really is like seeing the world a little differently - through my horse's eyes. I really look at that rock that I have ridden my so many times. I notice for the first time that , with the light low inn the sky, it could be a cougar crouching in the underbrush. That burnt tree stump might be a black bear. And the way the grass sways in the wind could mean some wild thing is hiding there. I, too, approach each bend in the trail with anticipation of what is around the corner. Maybe I even flinch a little when an eagle flies over. My old familiar world is fresh and new again - through the eyes of a two-year-old filly. Photos below are taken on that trail at another time. It is my wish for myself that I could be FEARLESS. The dictionary would describe FEARLESS as being "unafraid", "without fear" and it does mean that, but it means much more to me - FEARLESS means being afraid and doing it anyway! FEARLESS is living with your fears. FEARLESS is climbing on a colt for the first time when I know he could throw me and FEARLESS is trail riding alone when I know I could get lost or hurt, but FEARLESS goes far beyond that. For me, FEARLESS also means facing all the scary things in life - leaving home, falling in love, falling in love even if you've been hurt, having a child, saying goodbye, crying into your pillow, crying in front of the world, fighting for what you believe in and, most importantly, admitting guilt and wrong-doing. I think FEARLESS is also not believing someone who is not sorry no matter how many times he or she has said they are. FEARLESS can also be standing up for an unpopular opinion if it's your opinion, not backing down to ridicule, guilt trips or anger. FEARLESS is getting back up every time you are knocked down... even if you expect to be knocked down again. Have I achieved a FEARLESS state? It's a process. I can think of twice when I was downright terrified - when a grizzly lunged after me in the mountains and when a trusted friend turned on me. I didn't like the feeling. Many people are talking about skiing now, which made me think about the only time I tried the sport. Born and raised in Saskatchewan, I didn't have the opportunity to learn. When I moved to B.C., next door to fantastic alpine slopes, I kind of wished I had. Commitments at home, a lack of funds and a little lack of motivation kept me from the ski hills though . . . until a friend and his two children invited me to join them on Silver Star. "It's Lady's Day," he said. "You get a free lesson." The day dawned bright and reasonably warm for my debut on the slopes. I signed up, shooed my companions off and met my instructor, a young man who looked slightly bored (and probably a little disappointed that his student wasn't young, blond and single!). I strapped on skis and headed for the ski lift. When I got there, I didn't know how to get on. Who knew there was a trick to that? As I fumbled my way into the seat, I laughed. No one else did. Apparently these impatient skiers had no sense of humor! The ride to the top of the bunny hill was short but thankfully uneventful. Let the games begin! I had no problem staying upright on the skis so, with a few words of wisdom from my coach, I was ready to ski to the bottom, which I could easily see. It was not very far. Not so fast. My instructor had a different idea. He wanted to teach me to ski a short distance across the hill, turn, and ski back. That was a problem. Every time I turned, I fell. Every single time. I could stand up, keep my balance sliding down, but I could not keep on top of the skis when I turned. My instructor was getting frustrated. I was getting determined. I couldn't believe I could make a simple turn on skis. "Do you want to quit," he asked hopefully. I don't know how long we were there, but I never really did learn to turn. I finally figured out that my body was "on a horse" when I turned and I used my weight exactly opposite to what I should have! I finally felt sorry for my instuctor, who couldn't believe I wasn't tired yet, and headed down the little hill. That I could do without falling! I met my friend and his kids at the bottom. "You look like a hot horse," he said. Clouds of steam rose from me. My jeans were soaked with snow and the rest of me with my own sweat. No fancy ski outfits for me. I had come in western clothes. That is the only time I have been on skis, although I would have liked to go again. Two days later I was sick - really sick. Either I caught a flu from my escapade in the snow or one of the stone-faced skiers at the ski lift gave it to me. "Out with the old, in with the new" is a pretty common phrase around this time every year, but I won't say that at the beginning of 2011 or any other year. I kind of like "the old". Although I look forward to 2011 and do look ahead, the "old" has been kind to me. I managed my business by myself, I successfully showed my stallions, I stayed out of hospitals and off of medication, I published a book, I spent quality time with friends and most of all, I loved my life. I am grateful. What does 2011 hold for me? More of the same, I hope. I will welcome each day. It is a gift. I will embace each experience and look for new ones. I will spend time with my family and friends. I will even appreciate my aches and pains because they tell me I'm alive. Alive. That's what it's really about. Really alive. 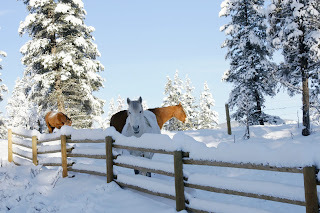 There is so much life around me - my horses, my garden, birds, trees - the list is endless. And there will be new life in the spring - five new foals! What a gift that is! 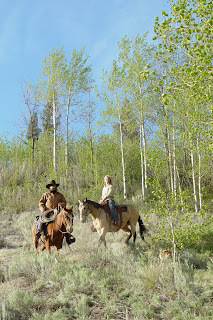 One 2010 blog post I titled "The Stars are Aligned" where I talked about 2011 Wildwood Reining Horses landmarks, but the post I try to live by each day is the one called "Alive and in the Present". To see and hear with a newness born of being aware of the present is really being alive. Hard to do when things go wrong, but oh, the rewards! I finished off my blog for 2010 with a whimsical, somewhat spiritual piece about connections, prayers and faith. I don't make New Year's resolutions but, as I embark on a journey into a new year, I'm going to try to hold on to that..